Not in picture: Andy Erickson – Screaming Eagle, Annie Favia – Favia Wines, Greg LaFollette – Tandem, Drew Neiman – Neiman Cellars, Gerhard Reisacher - Delectus. Good food and great wine amongst friends. 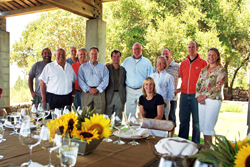 In July, we hosted a luncheon with our supporters and winemakers to celebrate the launch of our Portfolio of Winemakers. All of the wine produced by Lookout Ridge is in support of our Wine for Wheels program – providing the gift of mobility for people around the world.